A new study released this week by the Massachusetts Budget and Policy Center reports that the annual cost of the state’s business tax breaks has doubled to $770 million this year from $342 million in 1996. 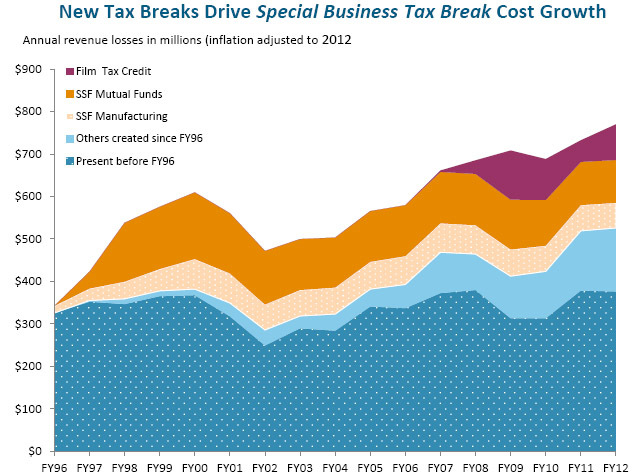 “Business Tax Breaks in Massachusetts” found that “sector specific tax breaks” (for particular industries) were largely to blame for the sizeable increase in cost. Of the specific industry tax expenditures, two in particular demonstrated rapid and substantial growth over the study period: Single Sales Factor tax breaks for manufacturers and mutual funds companies and the state’s Film Production Tax Credit. The authors further found that the spending through special business tax expenditures has increased by 60 percent, while during the same period total state budgetary spending has fallen by 5 percent. The MBPC prudently concludes that the value of each of the state’s business tax breaks needs to be “weighed against other types of economic development investments the state might make using these dollars, including various on-budget expenditures, for things like public education and transportation infrastructure.” Read the full report here. Subsidy Tracker, the Good Jobs First database of economic development subsidy awards, has just grown by more than 40 percent and now has more than 224,000 entries from 356 programs. Most of the increase comes from a list of more than 60,000 businesses in Los Angeles currently enjoying exemptions from the city’s gross receipts tax. We obtained the previously unpublished data from the city’s Office of Finance as part of our effort to expand Tracker’s coverage of local subsidy programs. Also included in the latest additions are local property tax abatement data from Texas counties for the period 2000-2009 assembled by the state comptroller. From officials in Dallas we obtained unpublished listings of tax increment financing deals as well as grants and loans under the city’s Public/Private Partnership Program. Finally, the latest additions include the Industrial Facilities Property Tax Exemptions awarded by localities throughout Michigan for the period from 2007 to 2011.